Palay Display Store Fixtures offers Slatbox Gridwall Display Bins. Slatbox Gridwall Display Bins provide you with a great solution for storage or display on gridwall. These durable Slatbox Display Bins are available in many different colors, sizes, and styles. Use our Slatbox Display Bins in your pharmacy to organize medication or in your garage to organize screws and nails. 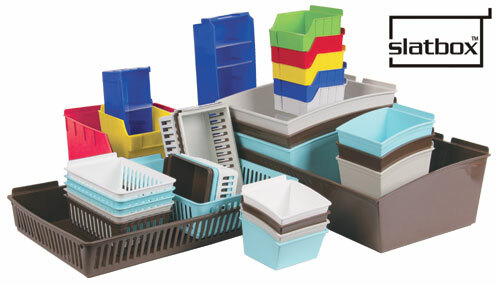 Slatbox Display Bins can withstand dishwasher and heat sterilization. Note that some Slatbox bins require the Gridwall Adapter (#35008) to fit gridwall panels. If you are unable to find the exact Slatbox Bin you are looking for, please chat online or call one of our sales representatives. Slatbox Gridwall Display Bins are versatile and functional. Our Slatbox Display Bins can be heated and sterilized to be used in your pharmacy or hospital. The Slatbox Display Bins are perfect for organizing medications or small tools. Easily display or store bulk food items in the Slatbox Display Bins. The Slatbox Display Bins are made from new food grade polypropylene. These Slatbox Bins are suitable for food contact applications and are FDA compliant. Palay Display Store Fixtures carries many different styles and sizes of the Slatbox Display Bins. The Cratebox Series Slatbox Display Bins are easy to clean and easy to hang in any shop. They are made to be space saving and cost effective. The Hobibox Series of Display Bins is an affordable and effective way to organize, store, and display merchandise. This series features a handy label holder and scoop front for easy identification and access. When presentation is important choose from the Popbox range. Designed specifically for retail display, the sturdy and stylish Popbox is available in a myriad of sizes and colours. Engineered to enhance your retail display display Popbox is a clear winner when it comes to attracting attention! Shelfbox and the entire Slatbox range is designed to be the most universal storage system on the market. Shelfbox Display Bins feature label holders and optional horizontal dividers for easy identification and sorting. Manufactured to fit smoothly into existing shop systems, the practical slathook doubles as a shelf hanglock, saving valuable display and storage space. Storbox Series Display Bins and the entire Slatbox range are designed to be the most universal storage products on the market. Storbox Series Display Bins are ideal for storing small parts- from nuts and bolts to beads and other craft supplies. Storbox, with it's innovative shape makes even the smallest items accessible and easy to display. Storbox Display bins also include a built in signholder.